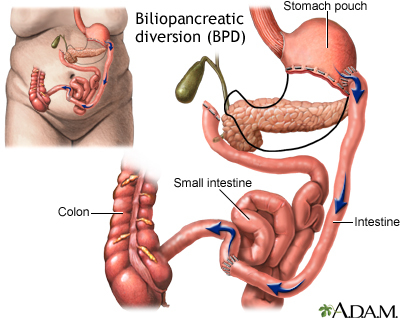 Malabsorptive operations, such as biliopancreatic diversion (BPD), restrict both food intake and the amount of calories and nutrients the body absorbs. In a BPD procedure, portions of the stomach are removed. The small pouch that remains is connected directly to the final segment of the small intestine, completely bypassing the upper part of the small intestines. A common channel remains in which bile and pancreatic digestive juices mix prior to entering the colon. Weight loss occurs since most of the calories and nutrients are routed into the colon where they are not absorbed.